Among many of Intel’s announcements today, a key one for a lot of users will be the launch of Intel’s 9th Generation Core desktop processors, offering up to 8-cores on Intel's mainstream consumer platform. These processors are drop-in compatible with current Coffee Lake and Z370 platforms, but are accompanied by a new Z390 chipset and associated motherboards as well. The highlights from this launch is the 8-core Core i9 parts, which include a 5.0 GHz turbo Core i9-9900K, rated at a 95W TDP. One, Two, Three, Four, Five, Six, Seven, Eight. Eight Cores. Leading from the top of the stack is the Core i9-9900K, Intel’s new flagship mainstream processor. This part is eight full cores with hyperthreading, with a base frequency of 3.6 GHz at 95W TDP, and a turbo up to 5.0 GHz on two cores. Memory support is up to dual channel DDR4-2666. 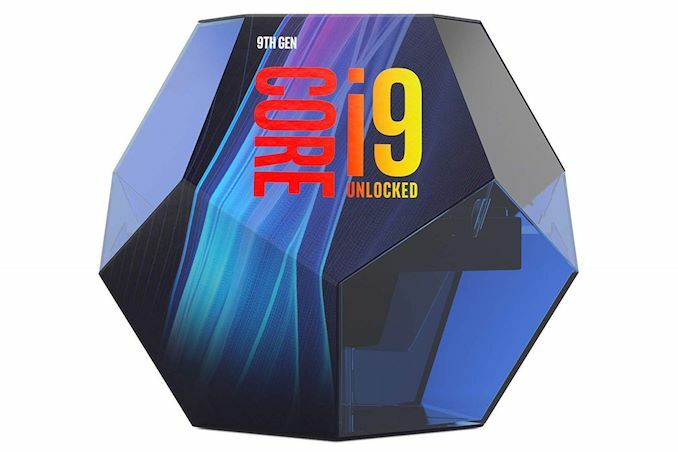 The Core i9-9900K builds upon the Core i7-8086K from the 8th Generation product line by adding two more cores, and increasing that 5.0 GHz turbo from one core to two cores. The all-core turbo is 4.7 GHz, so it will be interesting to see what the power consumption is when the processor is fully loaded. The Core i9 family will have the full 2MB of L3 cache per core. Also featuring 8-cores is the Core i7-9700K, but without the hyperthreading. This part will have a base frequency of 3.6 GHz as well for a given 95W TDP, but can turbo up to 4.9 GHz only on a single core. The i7-9700K is meant to be the direct upgrade over the Core i7-8700K, and although both chips have the same underlying Coffee Lake microarchitecture, the 9700K has two more cores and slightly better turbo performance, but less L3 cache per core at only 1.5MB per. At the time of writing, we are still awaiting pricing, although the Core i9-9900K was accidentally listed on Amazon for $582.50 last week. 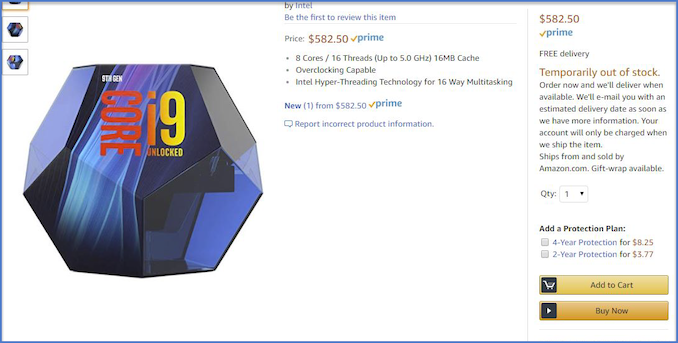 What we also saw from this accidental listing was the packaging: Intel would appear to be experimenting with a dodecahedron (12-sided figure) in an attempt to compete against AMD's elaborate packaging for its high-end CPUs. This is the first time in recent memory that Intel has expanded its packaging beyond that simple box, so it will be interesting to see how much it goes beyond the Core i9. Edit: Pricing has been updated. Also in our list of information, we have the per-core Turbo ratios for each of the three overclocking-capable CPUs. Users who read our Core i7-8086K review, which was Intel’s first 5.0 GHz processor, may remember that it offered a single core of 5.0 GHz turbo, and the knock on effect of that was we never really saw the magic 5.0 GHz number. Because of background processes and whatnot, we very often see the 2-4 core turbo values in most processors. This time around, at least with the Core i9, Intel has put the first two cores at the peak turbo frequency. 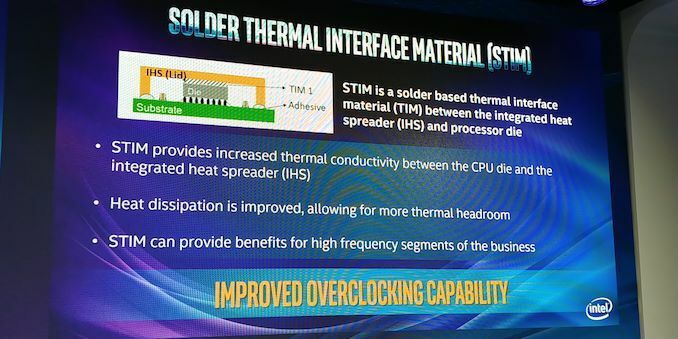 In recent times Intel has opted to use a cheaper thermal interface comprised of a paste which in comparison to solder has a lower thermal conduction rating and thus led to a number of solutions cropping up which allowed users to delid the IHS from the chip and replace the cheaper material. The fact the new Intel 9th generation processors will indeed now feature a solder-based TIM means that the processors on the new 14++ process should in effect run cooler in comparison clock for clock and allow Intel and users to potentially overclock a little further. Intel’s 9th Generation Core family is built around the Coffee Lake platform, and as the processors have not had any microarchitectural changes, they are refreshes of the 8th generation parts but with the product stack laid out a little differently. For those keeping track, Coffee Lake was already a rehash of Kaby Lake, which was an update to Skylake. So we are on Skylake Refresh Refresh Refresh. Unknown Ice Lake (Consumer) 10nm? 2019? Intel has promised that its 10nm manufacturing process will ramp through 2019, and has already announced that it will introduce Ice Lake for servers on 10nm in 2020, after another run of 14nm with Cooper Lake in 2019. On the consumer side, the status is still in limbo – with any luck, the next generation of consumer parts will be a proper update to the microarchitecture, regardless of the process node. What makes this a little different are the eight-core products. In order to make these, Intel had to create new die masks for the manufacturing line, as their previous masks only went up to six cores (and before that, four cores). This would, theoretically, give Intel a chance to implement some of the hardware mitigations for Spectre/Meltdown. As of the time of writing, we have not been given any indication that this is the case, perhaps due to the core design being essentially a variant of Skylake in a new processor. We will have to wait until a new microarchitecture comes to the forefront to see any changes. What Intel has been doing however is optimizing its manufacturing process. Many have reported that Intel’s 14nm family of technologies is the most profitable manufacturing node in the history of the company. It should be noted that Intel has now eschewed names such as ‘14+’ and ‘14++’ on official marketing, choosing instead to call it ‘14nm family’ and to highlight optimizations in particular products. The results of these optimizations, whatever they might be, are usually bumps in frequency and performance at iso-power or less power, usually at the expense of a little die area. That would mean fewer dies per wafer, naturally increasing the cost of the product. The processors announced so far are 8-core and a 6-core parts, with leaks suggesting Intel will also produce 4-core and 2-core processors at a later date. There is no word if some of these parts share die representations (e.g. if a 6-core is a natural 6-core, or a cut 8-core, or if both will happen). Making new die masks is expensive, however it can be beneficial depending on the quantity of processors for each segment. However, Intel will want to do something with those 8-core dies that might not make it – a tactic used in its enterprise parts. All this aside, it would appear that Intel is also forgoing HyperThreading on most of its processors. The only Core processors to get HyperThreading will be the Core i9 parts, and perhaps the Pentiums as well. This is partly to help make the product stack more linear, and so cheaper chips are not treading on the toes of the more expensive ones (e.g. a quad-core with HyperThreading might outperform a 6-core without). The other angle, I suspect, is one of the side-channel attacks that can occur when HyperThreading is in action. By disabling HyperThreading on the volume production chips, this security issue is no longer present. It also ensures that every thread on that chip is not competing for per-core resources. One of the more interesting dissections of the new 9th Generation product is in the L3 cache per core for the different models. In previous generations, the Core i7 parts had 2 MB of L3 cache per core, while the Core i5 had 1.5 MB of L3 cache per core, and the Core i3 was split between some with 2MB and others with 1.5MB. This time around, Intel is only putting the full cache on the highest Core i9 parts, and reducing the Core i7 to 1.5MB of L3 per core. This will have a slight knock-on effect on performance, which when we get the processors will be an interesting metric to test. I’ve had an 8-Core for Years! Depending on where you draw the line for ‘consumer’ processors, technically we have had 8-core Intel CPUs on the high-end desktop space for a number of years. The Core i7-5960X was released in August 2014, and features eight Haswell cores on the HEDT platform, with quad-channel DDR4-2133 memory and 44 PCIe lanes at 140W. Back then, on Intel’s 22nm process, the die size was around 355.52 mm2. Back when Intel launched the first Coffee Lake processors, the 6+2 die design of the i7-8700K was around ~151 mm2, an increase of ~26mm2 over the 4+2 design of the i7-7700K (~125mm2). That also took place during a jump from Intel’s official 14+ to 14++ manufacturing nodes, which due to a relaxed fin pitch made everything a bit bigger anyway. But if we take 26mm2 on the high end of adding a pair of cores to the die size, then we can predict that the 8+2 design of the Core i9-9900K should come in around ~177 mm2, or a 17% larger die size. At 177mm2, this would be half the size of the Core i7-5960X, although with only half the memory controllers and PCIe lanes too. Even with that, it’s a sizeable decrease. This is where I point out that in order for Intel to keep profit margins the same on its highest parts, that 17% increase in die area might directly translate to a 17% increase in price. At the time of writing this, Intel has not announced pricing, but at a tray price of $359 for the last generation 8700K 6+2 chip, a 17% increase puts it in the region of $420. Anything more than that, and Intel is either increasing its margins or dealing with how many chips actually bin to the required frequency. But as shown in the Amazon link above, $582 is a bigger increase. One topic that Intel has not focused on much in several generations (since Broadwell, really) is that of integrated graphics. All the chips announced for the 9th generation family will still have the same GT2 configuration as the 8th generation, including the new Core i9 parts. Officially these come under the 8+2 designation. Intel still believes that having a form of integrated graphics on these high-end, overclockable processors, is still a value addition to the platform. The only downside is the performance, and it won’t be winning any awards soon. The graphics will still be labelled as UHD Graphics 630, and use the same drivers as the 8th gen family. One of the worst kept secrets this year has been Intel’s Z390 chipset. If you believe everything the motherboard manufacturers tell me, most of them have been ready for this release for several months, hence why we’re going to see about 55+ new models of motherboard hit the market over the next few weeks. For the Z390 chipset and motherboards, we will have our usual every-board-overview posted today, covering every model the manufacturers would tell us about. Interestingly there is going to be a mini-ITX with Thunderbolt 3, and one board with a PLX chip! 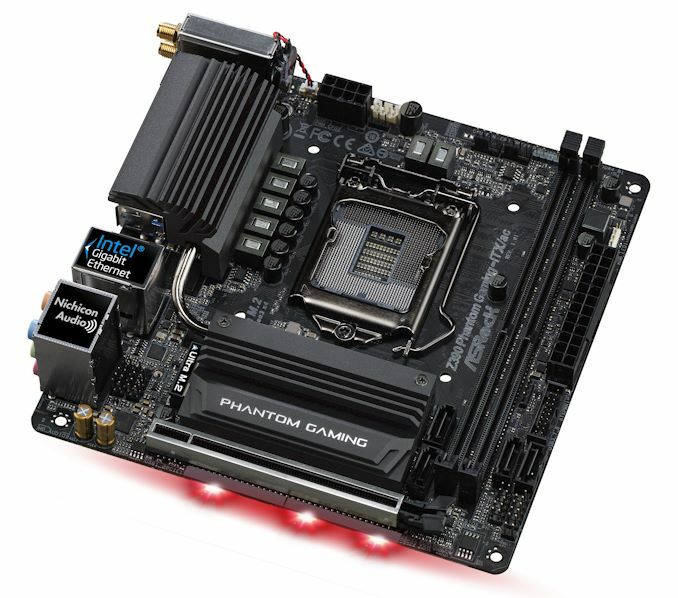 There are also some motherboards with Realtek’s 2.5G Ethernet controller, which consumes on 1.6 W – now if only we also had consumer grade switches. From here, Intel will have CPUs on shelves on October 19th in most (if not all) major markets. The review embargo for the three K processors is also for the same date, at 9am Eastern Time. I’ll be running my new scripts on as many processors as possible. Let me know what comparisons you want to see in the comments below. Yup. The 2080 Ti is, adjusted for inflation, considerably more expensive than the Matrox Millenium was in 1994 and the Millenium was the highest end for everything at the time, not only gaming. What happened was that GPUs started using bleeding edge processes and taking bigger slices of the wafer with its associated lower yields and more waste. Voodoo was a toy using just over a million transistors on a half micron. On a die equivalent it was like fabricating a 486 DX4 in late '96. You could use all the spare capapcity that was sitting around after the bleeding edge guys matured the process and moved on. It still is CPU power that is holding you back.. In Davinchi Resolve you wont see any performance change between a 1060 and a 2080 ti. They are equal fast.. What is holding it all back is CPU power.. That is all the way up to 6K.. At 8K you begin to see a little difference. But not much. Resolve likes cores, and as such you can use 32-core threadripper and get fast performance. Atleast in rendering. With Premiere Pro it is the same story but with the 1070 instead. But Pr likes frequency more than just plain cores.. So it is a mixture and for that you need fast cores. Not many. If I remember correctly it wont benefit of anything over 12 cores. So I think the i9 9900K with 8 cores of good speed is a good way to go. But many takes like Warp stabilizer only works on one core pr. effect. If you use programs that use the CPU, then the cpus are holding you back. If you use programs that use the GPU, then the gpus are holding you back. Way to ignore the argument and see what you want to see.. You're preaching from a narrative and won't accept anything out of it.